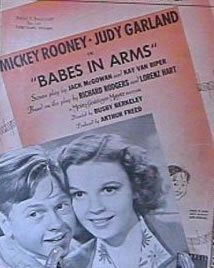 Academy Award Nominations: Best Actor (Mickey Rooney) and Best Score. 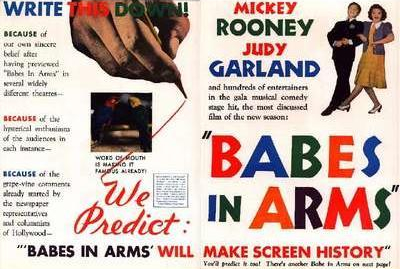 Older TV prints (and early video releases) of Babes In Arms run 91 minutes, and exclude the "My Day" segment of the finale, with Mickey Rooney and Judy Garland spoofing Franklin and Eleanor Roosevelt. This segment was deleted for a 1948 reissue. "My Day" was restored in the 1990's by Ted Turner, and is included in current prints. Not much of Busby Berkeley's visual dynamism is in evidence in this MGM juvenile musical (1939), with Mickey Rooney and Judy Garland leading a gang of ex-vaudeville stars' kids in putting on a fund-raising show to save their parents from bankruptcy. In general, it's pretty hard to take, but Berkeley's crane is sublime during the "Babes In Arms" number. With Charles Winninger and Guy Kibbee. One strictly for Rooney and Garland fans, this has the children of vaudeville parents put on a show to prove that the spirit of the variety show is still very much alive. This adaptation of the Rogers and Hart musical takes many liberties with the original (in fact not much of it remains), but the music - including 'Good Morning', later used in Singing in the Rain - is great. If you can stomach precocious young things - and Rooney doing impressions ranging from Clark Gable to President Roosevelt - this will pass the time nicely. For the rest of us it is best avoided. 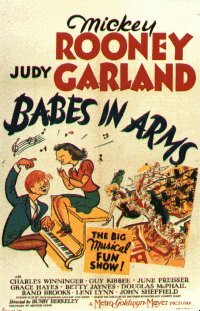 This quintessential Mickey Rooney-Judy Garland musical has all the kinetic energy and beaming goofiness that made their films together (nine in all) so popular--and so easy to lampoon. The son of a vaudeville performer Charles Winninger, Rooney decides to put on his own show (in a barn!) to save his family's fortune, his town, his peers, and, gosh darn it, even the American way of life. The star luster generated by Garland matches the explosive energy of Rooney's performance. Director Busby Berkeley's big production numbers are a sight to behold, from a march through town for the title number to an embarrassingly dated minstrel show routine. The movie was made the same year as The Wizard Of Oz (1939) and featured the same villain: Margaret Hamilton. How popular was Rooney at the time? The number one box-office attraction was nominated for best actor at age 19 in that landmark year against some of the most famous performances of all time: Laurence Olivier in Wuthering Heights, Clark Gable in Gone With The Wind, James Stewart in Mr. Smith Goes To Washington, and winner Robert Donat in Goodbye, Mr. Chips. The film version of the Rodgers and Hart (1937) musical has been considerably embellished in its transfer to the screen. Basic idea is there, and two songs are retained. Otherwise, it's a greatly enhanced piece of entertainment, with Mickey Rooney having a field day parading his versatile talents. He sings, dances, gives out with a series of imitations including Eddie Leonard, Clark Gable, Lionel Barrymore, and President Roosevelt. With Judy Garland he sings "Good Morning," a new tune by Nacio Herb Brown and producer Arthur Freed; he pounds the ivories; he directs a kid's show to provide impersonations, and a dinner table sequence, with a mix-up of decisions on the silverware, is an old routine but his technique and timing make for grand fun. Direction by Busby Berkeley is enthusiastic and at a fast clip throughout. Rodgers and Hart's musical, minus most of their songs, and one that's left, "Where Or When," is trammeled to death. What remains is energetic but standard putting-on-a-show vehicle for Mickey and Judy. Dated fun. Originally ending was a production number spoofing Mr. and Mrs. Franklin D. Roosevelt, which was later removed for a 1948 reissue and never restored. This version of the Rodgers and Hart Broadway musical didn't retain much of their material, but it starred Judy Garland and Mickey Rooney as the children of vaudevillians, and it has great charm. . The direction is likeably naive, the choreography is primitive-surreal.